Owning gold can be an attractive insurance policy in case of stock market turmoil or a decline in currency valuation. In times of economic uncertainty, gold prices tend to increase even when the value of other investments goes down. 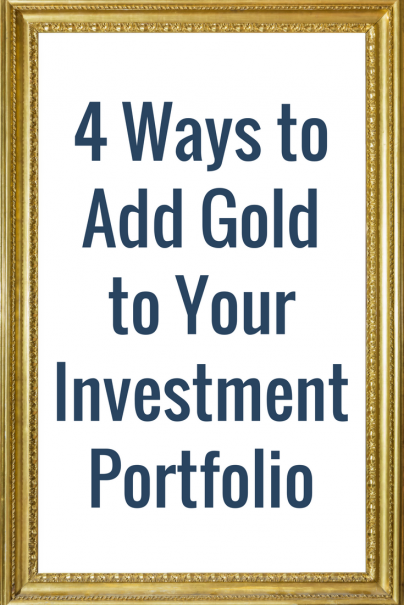 If you are looking to reduce your exposure to stock market investments, or simply want to have something of value to trade in case of a zombie apocalypse, here are four ways you can invest in gold today. The selling price of these coins floats with the price of gold, plus you will pay a few percent premium for getting a minted coin instead of a plain piece of gold. With the current price of gold at over $1,200 an ounce, you can find 1/10 ounce American Eagles selling from dealers for under $150. Gold coins produced by the U.S. Mint are not sold directly to the public, but may be purchased from a network of authorized bullion dealers who buy the coins from the mint for resale. Another option is the American Buffalo gold coin that comes in a 1 ounce denomination. This is a legal tender coin whose gold content is guaranteed by the U.S. Government. These coins are available at coin dealers and participating banks. The South African Krugerrand, Canadian Gold Maple Leaf, Australian Gold Nugget, Chinese Gold Panda, and British Gold Britannia are other popular gold coins from around the world. A less expensive alternative to gold coins is to buy gold bars or gold rounds. These are not as impressive to look at, but are priced near the current trading price, or "spot price," for gold. This form of bullion may have simple markings with the weight and purity of the gold. If the thought of keeping gold hidden in your closet or safe makes you nervous, consider using a bullion trading and storage platform. You can buy and sell physical gold bullion and it never has to leave the secure vault where it is stored unless you want to take it out. This gives you the benefit of directly owning gold without the hassle of transporting and storing it. An advantage of buying gold in the form of jewelry is that you can wear and enjoy your investment, and it is highly transportable. A smart way to invest in gold is to give gold jewelry as a gift. A gift of precious metal jewelry will hold its value and possibly grow in value while most other gifts depreciate and eventually end up in a landfill. When buying gold jewelry, you need to pay attention not only to the weight of the jewelry, but also the purity of the gold. Pure gold is designated as 24 karat gold. But pure gold is too soft and malleable for jewelry, so it is often mixed with other metals to make the jewelry harder and stronger. For example, jewelry that is 18 karat gold is 18/24, or 75 percent gold and 25 percent other metals. You can divide the karat rating of jewelry by 24 to determine the fraction of gold that it contains. Sometimes you can find broken, tangled, or damaged gold jewelry for sale at a pawnshop for less than the spot price of gold. Just make sure you are buying solid gold, and not just gold plated items. A gold ETF is a fund that aims to track the price of gold. Some funds actually hold gold, while others do not own gold, but use derivative contracts instead. Gold ETFs allow a quick and easy way to get an investment that tracks the price of gold, and are convenient for large transactions since you do not need to move or store a lot of gold. There are a couple of potential downsides to investing in a gold ETF. When you buy shares in a gold ETF, you might not actually own any gold — in some cases, you will own only shares in the fund. Since the fund tracks the price of gold, you may not have a problem with this. But if you are trying to reduce your exposure to large financial institutions by investing in gold, buying shares in a fund run by a large financial institution might not meet your goal. Also, some gold ETFs sell some of the gold that they hold to cover expenses, so the amount of gold per share that you own can be reduced over time. Another way to get a piece of the gold market is to buy stock of companies involved in gold mining and gold production. When gold prices go up, the stock prices of these companies can also go way up. Conversely, when gold prices go down, the stock prices of these companies can go way down. You can buy individual company stocks or mutual funds that provide holdings in a number of companies in the gold industry. This market segment is especially volatile, but may provide a hedge against other types of investments in your portfolio.